in global supply chains using leading edge, easy to implement solutions. Our solutions are used worldwide by nearly 500,000 suppliers. Read about some of our work across the private and public sectors. NQC is a diverse, technology-led company with over 10 years experience of tackling the biggest challenges in global supply chains. Get in touch to find out how NQC can help achieve your supply chain goals. or to arrange an NQC SCRiM™ demonstration. Access a supplier registration portal provided by NQC. Select a link to visit the relevant portal, and sign in or register. multiple tiers of the supply chain. In partnership with governments and primes, NQC uses secure technology to help assure contracts and protect defence supply chains from cyber attack. NQC has supported supply chain assurance in the Defence sector, in partnership with governments and primes, for over 10 years. Our solutions include the Supplier Cyber Protection Portal – designed to deliver the Defence Cyber Protection Partnership (DCPP), part of £2 billion investment in the UK Cyber Security Strategy. We understand the challenges of protecting information through multiple tiers of the defence supply chain, from supplier engagement to risk assessment and mitigation. NQC technology combines intelligence on key locations, suppliers and country risk, to help understand and mitigate threats to defence organisations and their supply continuity. 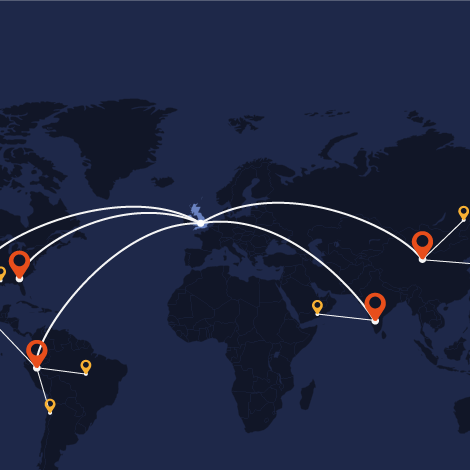 We map the geography, capability and relationships of multi-tiered supply chains, ordering and prioritising intelligence important for your business and its customers. Our platforms analyse a range of data to help long-term strategic planning of supply chain resilience.